Suitable for all levels that want to learn to make clothes. Please bring pattern, fabric and thread etc. A mixed session covering dressmaking, sewing, patchwork and embroidery, make what you want to. Please bring your project. Thursday 4th – 18th April 10am – 12.30 £35 including all materials used in sessions. Create this great bunny bag designed by Kerry. We will dye our fabric, learn embroidery stitches and also create the bag using patchwork techniques. 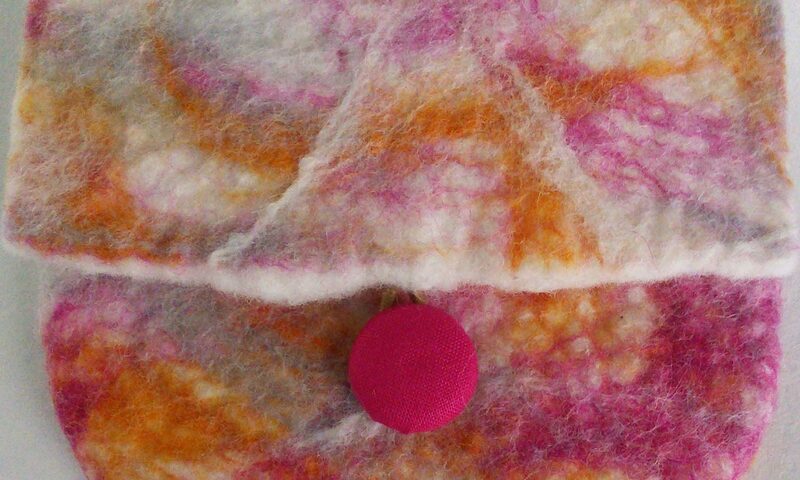 Come along and learn the basics of needlefelting, we will look at making them using a polystrene centre and using a wool core. Materials included for use in the session. Kerry will teach you the basic stitches of double, half treble and treble before moving on to a crochet a basic granny square. A great course for complete beginners or those wanting to refresh their memory. Great introduction to patchwork with this log cabin chicken doorstop designed by Kerry – makes a fabulous gift whilst using up your scraps. Choose to make either the unicorn or the dragon cushion (you will get the templates for both) in this new workshop. Which will use choose to make? Tunisian crochet is a hybrid of knitting and crochet. Learn the basic Tunisian crochet stitches in this introductory workshop, no previous knowledge of knitting or crochet is needed. Please ask for a materials list for courses you are interested in. Prices per person. Courses must be paid in full at time of booking. Course fee only covers the specified weeks and is not transferable or refundable, see Terms and Conditions for more information. Contact Kerry at Cotton On. 303 Marine Road Central, Morecambe, LA4 5BY tel: Kerry on 07970252718, email: cottonon@instruction.com or visit Cotton on to book or for more information. Under 16’s need to be accompanied.